For those who love stories of the Indians, and the strange and perilous adventures of white men in dealing with the forest tribes, we cannot do better than give a remarkable anecdote of life in the Virginia woodlands three centuries ago. On a day near the opening of the winter of 1608 a small boat, in which were several men, might have been seen going up the James River under the shadow of the high trees that bordered its banks. They came at length to a point where a smaller stream flowed into the James, wide at its mouth but soon growing narrow. Into this the boat was turned and rowed briskly onward, under the direction of the leader of the expedition. They were soon in the heart of the wildwood, whose dense forest growth clustered thickly on either bank of the stream, which ran in a narrow silver thread through the green wilderness. The stream they pursued is that now known as the Chickahominy River, so called from an Indian tribe of that name, the most, daring and warlike of all the Indians of the region. As they went on the stream grew narrower still, and in time became so shallow that the boat could go no farther. As they sat there in doubt, debating what had better be done, the bushes by the waterside were thrust aside and dusky faces looked out upon them through the leaves. The leader of the whites beckoned to them and two men stepped out of the bushy thicket, making signs of great friendliness. They pointed to the large boat, and indicated by gestures that they had smaller craft near at hand and would lend one to the whites if they wished to go farther up. They would go along with them and show them the way. "Do not leave your boat on any account. These fellows seem all right, but they are never to be trusted too far. There may be more of them in the woods, so be wide awake and keep your wits about you." The two Indians now got into the canoe with Smith and his men and began to paddle it up the stream, keeping on until they were miles from the starting-point. Undergrowth rose thickly on the banks and vines hung down in green masses from the trees, so that the boat they had left was quickly lost to sight. Soon after that the men in the large boat did a very foolish thing. Heedless of the orders of their leader, they left the boat and strolled into the woods. They had not gone far before a party of Indians came rushing at them with wild cries, and followed them fiercely as they turned and ran back to their boat. One of them was caught by the Indians, and as the fugitives sprang into their boat they were horrified to see the hapless fellow killed by his captors. This lesson taught them not to leave the boat again. Ignorant of all this, Smith went on, the boat being paddled here under a low canopy of vines, there through open spaces, until far up the stream. At length, as passage grew more difficult, he bade his guides to stop, and stepped ashore. Taking one of the Indians with him, he set out, carbine on shoulder, saying that he would provide food for the party. He cautioned his two followers, as he had done those in the large boat, to keep a sharp lookout and not let themselves be surprised. But these men proved to be as foolish and reckless as the others. The air was cool and they built a fire on the bank. Then, utterly headless of danger, they lay down beside it and soon were fast asleep. As they lay slumbering the Indians, who had started up the stream after killing their prisoner at the boat, came upon them in this helpless state. They at once killed the foolish pair, and then started into the woods on the trail of Smith. Daring and full of resources as Captain John Smith was, he had taken a dangerous risk in thus venturing alone into those forest depths, peopled only by prowling and hostile Indians. It proved to be the most desperate crisis of his life, full of adventure as this life had been. As a youthful soldier he had gone through great perils in the wars with the Turks, and once had killed three Turkish warriors in single combat between two armies, but never before had he been in such danger of death as he was now, alone with a treacherous Indian while a dozen or more of others, bent on his death, were trailing him through the woods. He was first made aware of his danger when a flight of arrows came from the low bushes near by. Then, with fierce war-whoops, the Indian braves rushed upon him with brandished knives and tomahawks. But desperate as was his situation, in the heart of the forest, far from help, surrounded by foes who thirsted for his blood, Smith did not lose his courage or his coolness. He fired his pistol at the Indians, two of them falling wounded or dead. As they drew back in dismay, he seized his guide and tied him to his left arm with his garter as a protection from their arrows, and then started through the woods in the direction of the canoe. Walking backward, with his face to his pursuers, and keeping them off with his weapons, he had not taken many steps before he found his feet sinking in the soft soil. He was in the edge of the great swamp still known in that region, and before he was aware of the danger he sank into it to his waist and his guide with him. The other Indians held back in fear until he had thrown away his weapons, when they rushed upon him, drew him out of the mud, and led him captive to the fire where his two companions lay dead. Smith's case now seemed truly desperate. He knew enough of the Indians to have very little hope of life. Yet he was not inclined to give up while a shadowy chance remained. Taking from his pocket a small compass, which he carried to aid him in his forest journeys, he gave it to the Indian chief, showing him how the needle always pointed to the north. But while the chief was looking curiously at this magic toy, as it seemed to him, the other Indians bound their captive to a tree, and bent their bows to shoot him. Their deadly purpose was prevented by the chief, who waved the compass in the air and bade them stop. For the time the mystery of the compass seemed to have saved the captive's life. Smith was now taken through the woods, the journey ending at an Indian village called Orapakes. Here the dusky women and children took the captive in hand, dancing wildly around him, with fierce cries and threatening gestures, while the warriors looked grimly on. Yet Smith bore their insults and threats with impassive face and unflinching attitude. At length Opechancanough, the chief, pleased to find that he had a brave man for captive, bade them cease, and food was brought forth for Smith and his captors. While they were in this village two interesting examples of the simplicity of Indian thought took place. Smith wrote a message to Jamestown, the settlement of the whites, sending it by one of the Indians, and receiving an answer. On his reading this and speaking of what he had learned from it, the Indians looked on it as the work of enchantment. They could not comprehend how "paper could talk." Another thing was the following: They showed him a bag of gunpowder which they had somehow obtained, saying that they were going to sow it in the ground the next spring and gather a crop of this useful substance. After spending some days in this and other villages, the captive was taken into the woods, his captors making him understand that they were going on a long journey. Whither he was being taken or what was to be his fate Smith was not aware. The language of gestures, which was his only way of conversing with the Indians, soon reached its limit, and he was quite ignorant of what they proposed to do with him, though his heart must have sunk as they went on day after day, northward through the forest. On they walked in single ale, Smith unbound and seemingly free in their midst, but with a watchful Indian guard close beside him, ready to shoot him if he made any effort to escape. Village after village was passed, in each of which the women and children danced and shrieked around him as at Orapakes. It was evident they knew the value of their prisoner, and recognized that they had in their hands the great chief of the Pale Faces. In fact, the Chickahominy chief felt that his captive was of too much importance to be dealt with hastily, and was taking him to the village of the great chief Powhatan, who ruled like an emperor over a powerful confederation of tribes. In slimmer his residence was near the Falls of the James River, but he was in the habit of spending the winter on the banks of York River, his purpose being to enjoy the fish and oysters of the neighboring Chesapeake. Wesowocomoca was the name of this winter residence, and here the captive was at length brought, after the long woodland journey. Captain Smith had met the old Indian emperor before, at his summer home on the James River, near where the city of Richmond now stands. But that was as a freeman, with his guard around him and his hands unbound. Now he was brought before him as a captive, subject to his royal will or caprice. He found the famous lord of the tribes in his large wigwam, with his wives around him, and his vigilant guard of warriors grouped on the greensward outside, where the Indian lodges stretched in a considerable village along the stream. Powhatan wore a large robe made of raccoon skins. A rich plume of feathers ornamented his head and a string of beads depended from his neck. At his head and feet sat two young Indian girls, his favorite wives, wearing richly adorned dresses of fur, with plumes in their hair and necklaces of pearls. Other women were in the room, and a number of the leading warriors who sat around gave the fierce war-cry of the tribe as the captive was brought in. The old chieftain looked with keen eyes on his famous prisoner, of whose capture he had been advised by runners sent before. There was a look of triumph and malignity in his eyes, but Captain Smith stood before him unmoved. He had been through too many dangers to be easily dismayed, and near death's door too often to yield to despair. 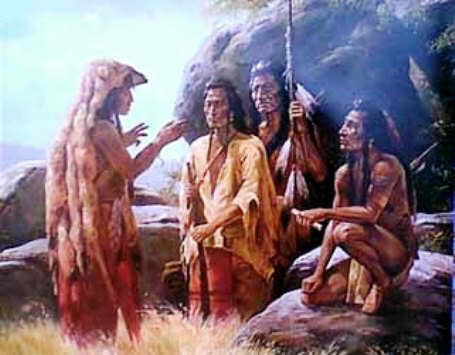 Powhatan gave an order to a young Indian woman, who brought him a wooden basin of water that he might wash his hands. Then she presented him a bunch of feathers to serve as a towel. This done, meat and corn-bread were placed before him. As he ate Powhatan talked with his warriors, consulting with them, the captive feared, upon his fate. But he finished his meal with little loss of appetite, trusting to the Providence which had saved him more than once before to come to his aid again. As he ate, his vigilant eyes looked heedfully around the room. Many who were there gazed on him with interest, and one of them, a young Indian girl of twelve or thirteen years of age, with pity and concern. It was evident that she was of high rank in the tribe, for she was richly dressed and wore in her hair a plume of feathers like that of Powhatan, and on her feet moccasins embroidered like his. There was a troubled and compassionate look in her eyes, as she gazed on the captive white man, a look which he may perhaps have seen and taken comfort from in his hour of dread. No such feeling as this seemed to rest in the heart of the old chief and his warriors. Their conference quickly ended, and, though its words were strange to him, the captive could read his fate in their dark and frowning faces. They had grown to hate the whites, and now that their leader was a captive before them, they decided to put him to death. There was no loss of time in preparation for the execution of the fatal decree. At an order from Powhatan the captive was seized and securely bound, then he was laid on the floor of the hut, with his head on a large stone brought in from outside. Beside him stood a stalwart Indian grasping a huge war-club. A word, a signal from Powhatan, was alone needed and the victim's brains would have been dashed out. At this critical moment Smith's good angel watched over him. A low cry of pity was heard, and the young girl who had watched him with such concern sprang forward and clasped her arms around the poor prisoner, looking up at the Indian emperor with beseeching eyes. It was Pocahontas, his favorite daughter. Her looks touched the old man's heart, and he bade the executioner to stand back, and gave orders that the captive should be released. Powhatan soon showed that he was in earnest in his act of mercy. He treated the prisoner in a friendly fashion, and two days later set him free to return to Jamestown. All that he asked in return was that the whites should send him two of their great guns and a grindstone. Smith readily consented, no doubt with a secret sense of amusement, and set out for the settlement, led by Indian guides. Rawhunt, a favorite servant of Powhatan, was one of the guides, and on reaching Jamestown Smith showed him two cannon and a grindstone, and bade him carry them home to his master. Rawhunt tried, but when he found that he could not stir one of the weighty presents from the ground, he was quite content to take back less bulky presents in their place.